The greatest benefits of the Honors College are the friendships that are formed and the community between the faculty and students. This community does not arise just in the classroom. 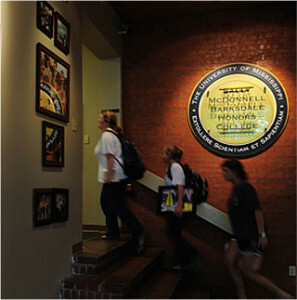 Honors students live on honors floors in the residence halls and enjoy 24-hour access to the Honors College building. The ONSA works with any student who may be eligible, but with the Office housed in the SMBHC, honors students have more exposure to the workshops and to individual meetings that can help them learn about opportunities in their areas and what it takes to become competitive for major scholarships. Assistance from the Honors College staff adds to the personal side of a public education. Whether it’s dealing with a course scheduling problem, or one of the deans advising them about a career option, the Honors College administration is here to help students succeed. The Honors College also has an information technology manager who is ready to help students with their computer problems. The Honors College offers fellowships to its students, for either a semester or year abroad. The Honors College also offers fellowships to help students who have received internships, since many of these are unpaid. As a freshman you will have the chance to participate in Freshman Ventures, an opportunity to travel to various regions of the United States to interview common (and some fairly uncommon) Americans, probing who we are, what we have achieved, what we can achieve, and how one leads a good life. Juniors may apply to participate in Junior Quest. Students arrange to interview an expert in their potential field in a major city to which all J-Quest students travel. The Honors College wants students to dream big and make us jealous. The Barksdale Award (monetary value of $5000) supports students willing to take risks with their time and efforts and who propose ambitious independent programs of study, research, or humanitarian effort.